Born in France in the early 60�s, Claude Bourbon grew up in Switzerland, where he was classically trained for many years. This finger picking guitarist has performed all over the world where he has crafted an unbelievable fusion of classical,jazz, Spanish, Latin and strains of Western folk together with ethereal Eastern influences. 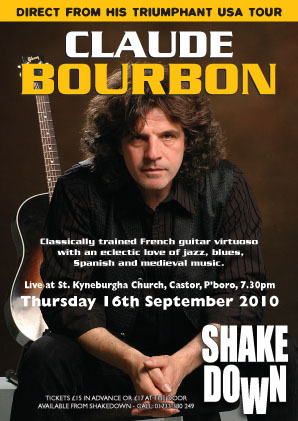 The unique Monsieur Bourbon is a formidable performer and his inimitable style incorporates all five digits on each hand dancing independently but in unison, plucking, picking and strumming at such speed and precision that his fingers often seem to melt into a blur. Thousands of people in the UK, Europe and USA have enjoyed listening to this virtuoso and for the majority of his audience it is an experience that compels them to return again to hear and watch him play. Some of Claude�s cited influences allow us a fascinating insight into this remarkable musician; Paco De Lucia: Richie Blackmore; Joaquin Rodrigo; JJ Cale, and JS Bach. The above is taken from Claude�s website. When I received an email from Claude�s management asking us if we would like to book him for Shakedown Blues show my initial reaction to the blues/classical/jazz/Spanish/Latin and Eastern influences was �no thank you�. However, I was intrigued and went to his website, listened to �Rodrigo�,was facinated and immediately booked him for a St Kyneburgha Church concert. I then dumped �Blues� from our logo for this show. After all Shakedown did book Mimi Farina at The Halcyon in the mid 60�s. This will be a classy show in a very classy venue.